Recently, I wrote an article about Freakonomics and mentioned that I would write a short review on Freakonomics. Today, I am going to jot down my thoughts briefly on this book. As you may have noticed, my book reviews consist of both recently published and not-so-recently published books, and I keep my reviews simple so my readers can make the most out of it. - What do schoolteachers and sumo wrestlers have in common? 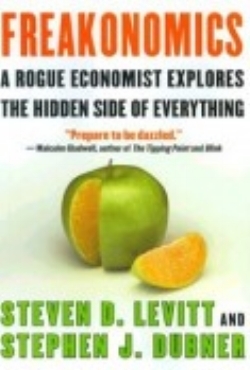 They both cheat in their own way and the authors use economic data and analysis to catch them. - How is the Ku Klux Klan like a group of real estate agents? This is all about abusing information. If you control information, you control everything. The authors try to connect the KKK and real estate agents by showing how individuals or groups can commit sins of information by hiding real information or promoting false information. - Why do drug dealers still live with their mom? Not all drug dealers are created equally; some of them can't even earn enough to live on their own. The authors present statistics to back this up. Freakonomics is full of intriguing facts and information; however, I do find it boring at times. If you read the beginning and the end of each chapter, you will find it riveting; in the middle, it feels far too overloaded with statistical facts and economic data. I am unable to rate this book as "A Must Read." I give it a "Worth Reading."